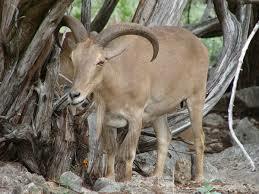 How many times have you heard the story about cooking Aoudad. Throw it all in the crockpot with some rocks, throw the Aoudad meat in the trash and eat the rocks! If I've heard it once I've heard it a thousand times. Fortunately for myself and Jancy we like to live on the edge with our food habits and therefore we never let meat go to waste, even if it is an Aoudad. Let me explain something that most hunters and fisherman know already but seem to forget, outdoorsmen lie...a lot! I'm personally a firm believer that Japanese Sika meat is even better than Axis meat and I'm here to tell you, Aoudad ewe meat is absolutely delicious. Like anything else, you need to take care of the meat properly but if done right, Aoudad ewe is some of the most tender meat an outdoorsmen will ever have the pleasure to eat. The key is aging and marinating. After you've cleaned the Aoudad, trim out any yellow fat and all silver skin/sinew from the meat. Anything you would use to make ground meat from a deer, do the same with the Aoudad. My preference is to purchase the HEB brand jalepeno bacon and grind it 60/40 Aoudad to bacon. Save half the meat for hamburger and add your sausage spices to the other half in order to make your pan sausage for breakfast. Take your de-boned and sinew free hindquarters and backstraps and place them on an open rack in a refrigerator. You can place a bowl/tub on the shelf underneath to catch any drippings. Leave them in this aging process for 14 days. I've tried shorter and longer aging times and 14 days seems to be perfect for the Aoudad meat. With the hindquarters I prefer to make roast with carrots and potatoes. With the backstraps I prefer to cook them whole on the BBQ pit at 300 degrees until the internal temp reaches the desired medium rare temperature. At this point let the meat rest for 10 minutes and then cut and serve as steaks. With either cut, the hindquarter or the backstrap, the proper marinade is half orange juice and half Italian dressing for a period of 24 hours. To improve the marinade, add the ingredients to a vacuum sealer bag and remove all air prior to placing in the fridge. Owner and Lead Guide of Black Water Guide Service. Sky has lead thousands of hunters through some of the most amazing experiences of there lives. Read Pro Hunting Tips from an experienced Texas guide who's been through it all.